Now Trump is president, and the real test begins as a man who has never held public office before starts at the top. In Mexico, Trump has been excoriated since he entered the race in June of 2015. And really, the hysteria in the Mexican media and among the political elite has been over the top and counter-productive. How much of the so-called “Trump Effect” on the Mexican peso has been caused by this hysteria, which implies that Mexico is powerless to protect its currency against a foreign politician? Some Mexican intellectuals have called for a scorched-earth policy. Enrique Krause said that Mexico shouldn’t even negotiate with Trump. Jorge Castañeda, who served for a time as Vicente Fox’s Foreign Minister, counsels the government to refuse to accept deportees unless American officials can prove they are Mexican citizens. Castañeda also says Mexico should use Central American immigration through Mexico as a bargaining chip against the United States. But what sense does that make? If the Trump administration walls off the border, all those Central American illegal aliens will be stuck in Mexico, and the Mexican government certainly doesn’t want that. Of course, neither Krause nor Castañeda really has to answer to the people over their policies. Nor does former president Vicente Fox, who is probably the Mexican politician most like Trump. Fox has gone on one hysterical anti-Trump rant after another. Once he was filmed standing in front of the Trump tower railing against The Donald. What does Fox gain with this? Well, certainly a degree of media attention. But the Enrique Peña Nieto administration is attempting to deal with the issues by congratulating Trump on his inauguration and then negotiating with him. And that team includes Luis Videgaray, who as of Jan. 4, is back in the government. Videgaray, as may be recalled, was pressured to resign as Finance Minister after arranging the visit of candidate Donald Trump back in September. Videgaray did that by negotiating with Trump son-in-law Jared Kushner. So Videgaray is not only back in the Mexican government, but he now holds the Foreign Ministry portfolio. Videgaray is not losing any time, planning to visit Washington (along with Economics Minister Ildefonso Guajardo) and to speak with U.S. officials. In this ambitious meeting, the plan is for Videgaray and Guajardo to meet with Reince Priebus (Chief of Staff), Jared Kushner and Stephen Bannon, National Security Adviser Michael Flynn, and others. 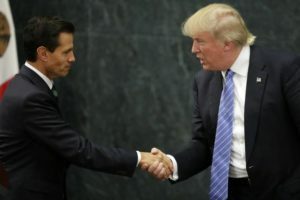 Then, on Jan. 21, a day after Trump’s inauguration, it was announced that Mexican President Enrique Peña Nieto will meet in the White House on Jan. 31 with President Trump himself. I hope these negotiations will be successful, and I hope that the Trump team will keep in mind that having a prosperous Mexico as a neighbor is in the best interests of the United States of America.